National Council of Young Israel welcomes US decision to combine consulate in Jerusalem with the new US Embassy. 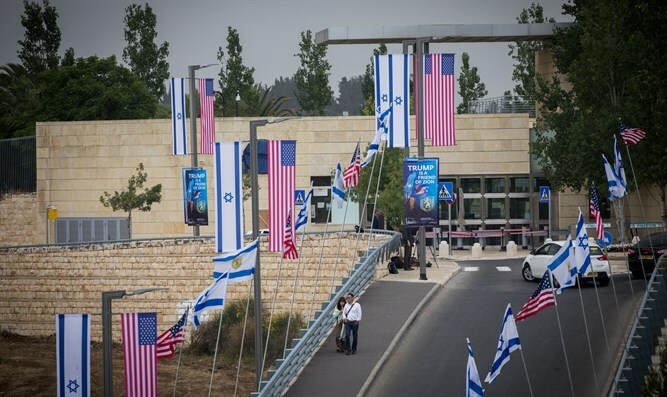 The National Council of Young Israel (NCYI) on Thursday hailed the decision of the United States to combine its consulate in Jerusalem with the new US Embassy that opened there in May 2018. “Shutting the US consulate in Jerusalem and merging it with the newly-opened US Embassy there is wholly consistent with the United States’ historic decision to recognize Jerusalem as Israel’s capital and to relocate its embassy there. This latest step is yet another indication of the Trump administration’s commitment to bestowing its blessing on Israel’s right to establish its own capital and the United States’ pledge to give proper credence to that determination,” NCYI said in a statement. “For over two decades, the National Council of Young Israel has worked tirelessly advocating for the abidance of the United States to the principles set forth in the Jerusalem Embassy Act of 1995, including the recognition of Jerusalem as Israel’s capital and the relocation of the US embassy to Jerusalem. In addition, we have long supported having the US treat its consulate in Jerusalem like any other consulate and having it report to the US embassy, rather than having it act like an embassy to the Palestinian Authority that reports directly to Washington, DC,” it added. “We give tremendous credit to President Trump, Secretary of State Mike Pompeo and Young Israel member and friend Ambassador David Friedman for making the correct decision to centralize the United States’ diplomatic efforts in Jerusalem under the auspices of the embassy. Their ongoing support of the US-Israel relationship and their extraordinary efforts to declare Jerusalem as the eternal capital of Israel and move the embassy there are greatly appreciated and we owe them our profound gratitude,” concluded the statement. Earlier on Thursday, Secretary of State Mike Pompeo announced that US would be shuttering a Jerusalem consulate facility in eastern Jerusalem, and would incorporate the services provided there in the US embassy on Agron Street. “The United States continues to take no position on final status issues, including boundaries or borders. The specific boundaries of Israeli sovereignty in Jerusalem are subject to final status negotiations between the parties,” he added. "The US decision... has nothing to do with 'efficiency' and a lot to do with pleasing an ideological US team that is willing to disband the foundations of American foreign policy, and of the international system, in order to reward Israeli violations and crimes," said PA negotiator Saeb Erekat. "The Trump administration is part of the problem, not part of the solution,” he charged.